DO NOT EDIT THIS PAGE!!! 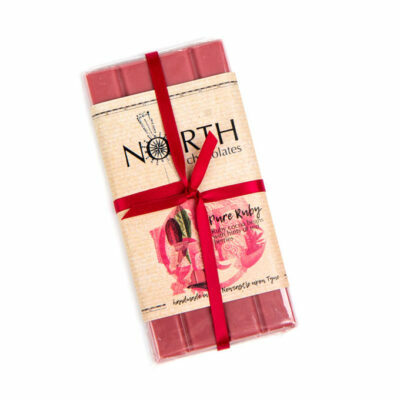 After thirteen years of development ‘Ruby’ chocolate was unveiled last year causing an instagram meltdown! We’ve now teamed it with one of our favourite seasonal fruits – the mighty Rhubarb! Fruity, with a slight sour yet sweet note and tang from the ‘barb’; we think it’s a winner! 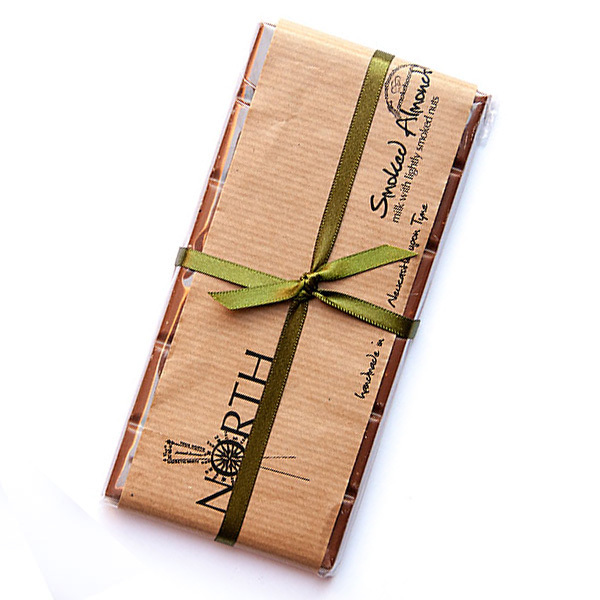 Our Salted Caramel Crunch bar went down a storm last year and we’ve finally managed to add it to our website! 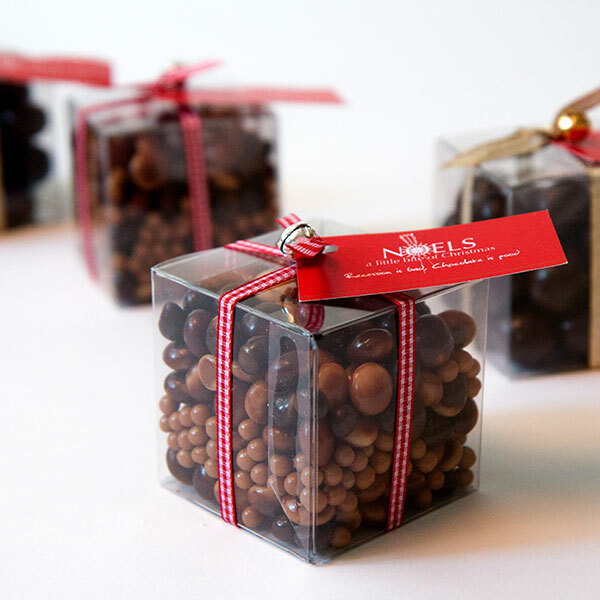 Sweet with a salty backnote and mini crunchy caramel balls for texture. No goo, just crunch! Earn brownie points this Mother’s Day – choose your mum’s favourite 4 bars and we’ll add a Poptastic Popcorn box in a lovely luggage style, reusable hamper. If you’re sending direct to your mum and would like a message adding – just let us know in the Notes section at the Checkout and we’ll pop it on for you! She cooks, she cleans, she shops and she’s always there when you want a shoulder to cry on – your mum’s a true angel!! 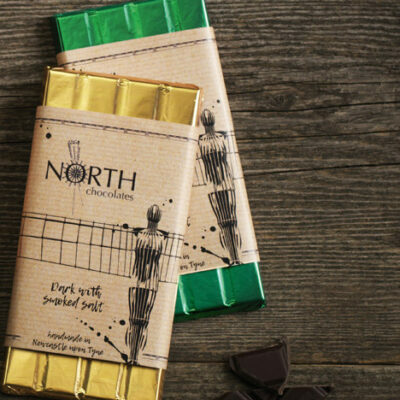 Tell her so with our award-winning Angel of the North bar and make her day. 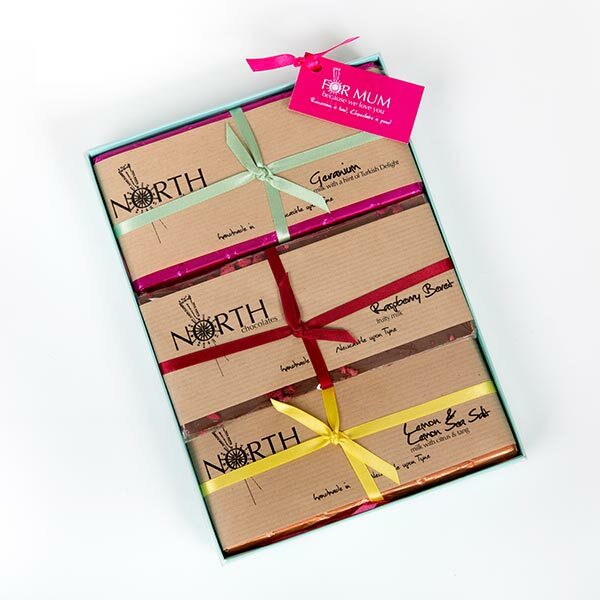 Treat your Mum with her favourite bars this Mother’s Day – choose any flavour and whether milk or dark (make sure you add your choice to the Notes section at the Checkout) and we’ll wrap it in a lovely reusable box. If you’d like a little message adding please add to the Notes section too! 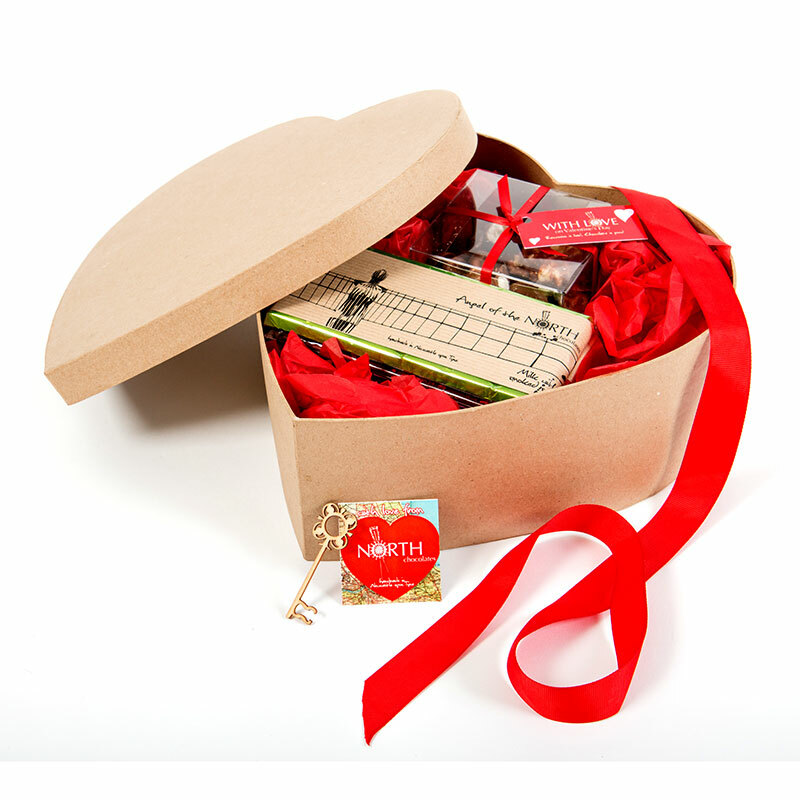 If you want to earn extra brownie points in 2019 this Be My Valentine Hamper could be the key to unlocking their heart (geddit?!) We’ve even included a mini key on the box for you! Just add their favourite 4 bars and we’ll top them with a sharing Poptastic Love Box so you can get your mits on some too. All’s fair in love and chocolate. Please let us know your preferred bars – and whether milk or dark – and choose between a milk or dark Love box when ordering in the ‘comments section’ when paying! 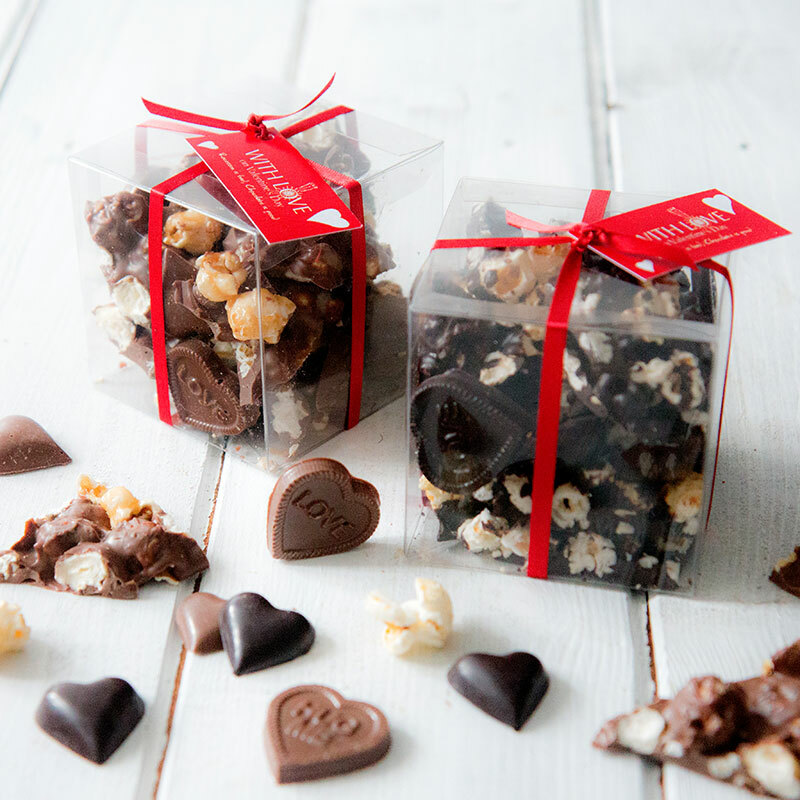 For Veggie love-birds, snuggle up with your other half, pop The Philidelphia Story on the telly and tuck into our poptastic sweet and salty popcorn sharing boxes. Honk honk! For Veggie and Vegan love-birds, snuggle up with your other half, pop The Philidelphia Story on the telly and tuck into our poptastic sweet and salty popcorn sharing boxes. Honk honk! 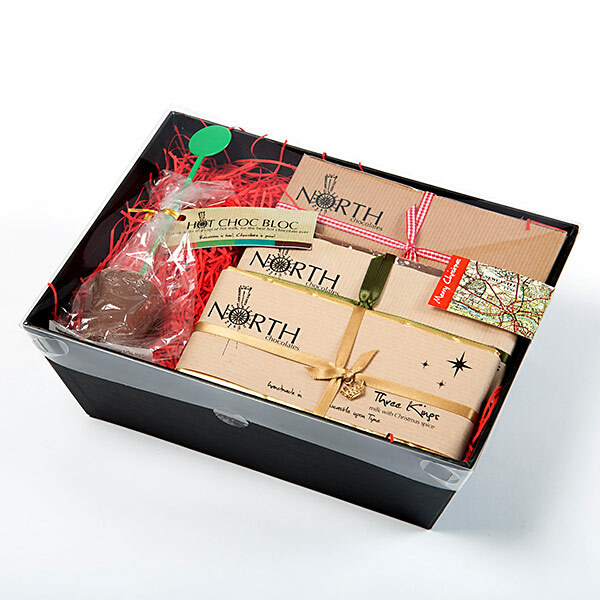 Small but beautifully formed – spread the Northern love with our stunning Icon gift box containing each of our 5 Icon & Innovation bars with illustrations by local artist Suzanne Homer. 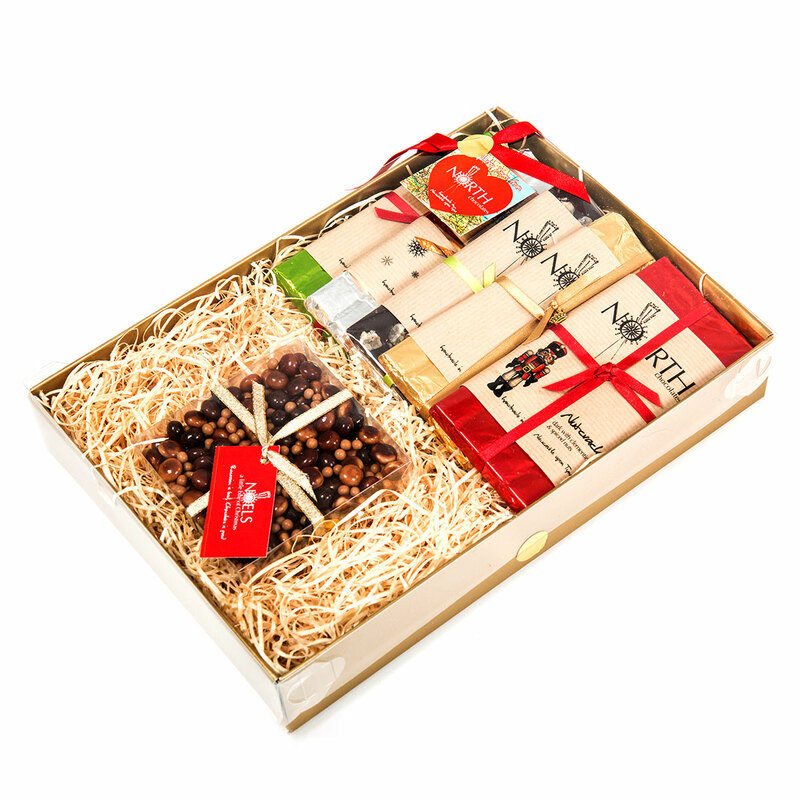 Perfect for the chocolate lover in your life – or even you! 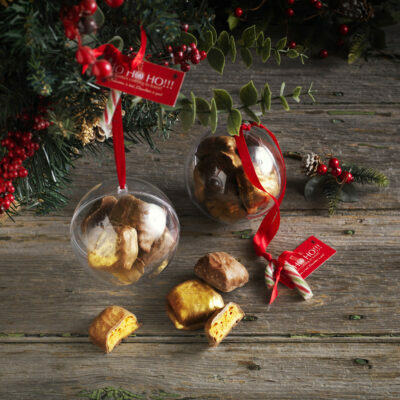 Our new Ho Ho Ho Baubles are filled with large chunks of milk chocolate covered honeycomb pieces – perfect for that festive lull in front of the fire! Our new Ho Ho Ho Honeycomb pieces are added to this festive hamper – just pick your favourite 5 bars * and we’ll do the rest! *Please state your choice of bars and whether milk or dark in the notes section when ordering. If you have no preference we’ll send a mix of milk and dark to surprise you! 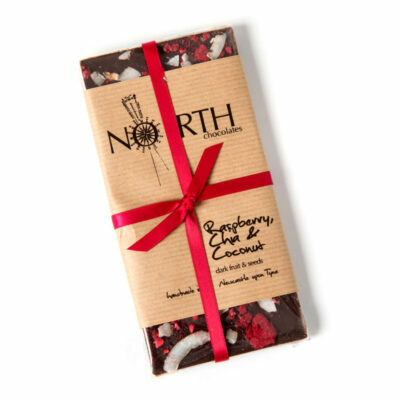 With the addition of protein packed chia seeds and toasted coconut this is a humdinger of a raspberry bar, even if we do say so ourselves! We’re as nutty for UNESCO World Heritage site, Durham Cathedral as author Bill Bryson, so our homage is a fabulous rich, dark chocolate hailing from Tomaco in Colombia stuffed with toasted hazelnuts. 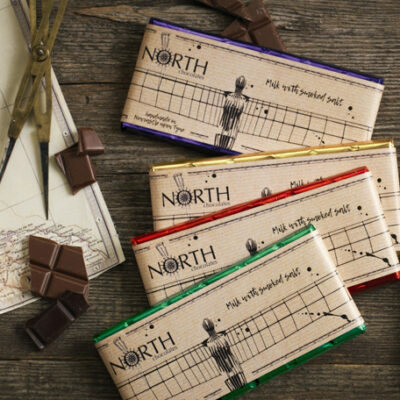 Our wonderful Tyne Bridge is captured beautifully by artist Suzanne Homer and a classic deserves a classy milk chocolate. 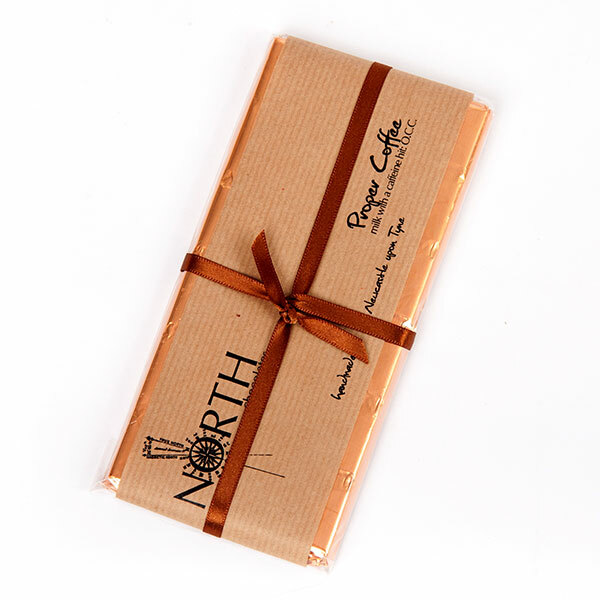 Using Single Origin Colombian beans this is a ‘dark’ milk bar – a whopping 45% with terrific caramel notes. Celebrating the amazeballs Rocket – the innovative locomotive designed by North East engineer Robert Stephenson – this is a dark bar infused with lemon and orange (to symbolise the flames – geddit??!) with additional popping candy to add some pop into your rocket! 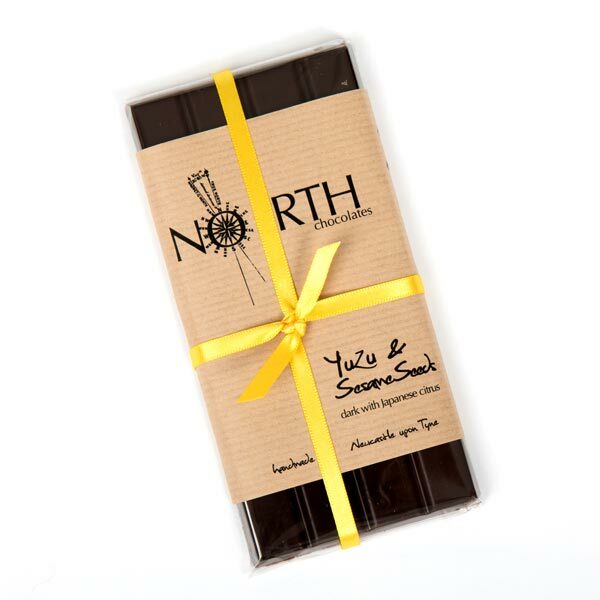 A subtle Earl Grey tea infused bar with additional bergamot and orange to celebrate our ‘Great Reformer’, Northumberland’s Charles Grey, former PM and pivotal in the abolition of the slave trade. 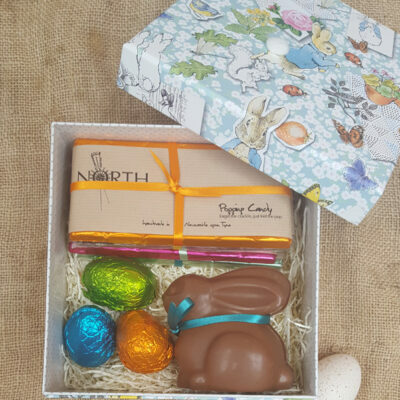 Gorgeous Easter box filled with your favourite gourmet chocolate bars along with Mr Bunny and milk mini jewel eggs. Hoppy Easter folks! NB: Please state your favourite bars in the Notes section at Checkout. 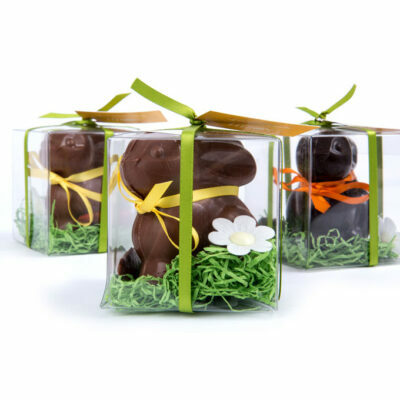 Choose from a clear or gold lid and pick your fave three bars and voila – a present ready to go! Make sure you let us know in the Notes section when ordering or if you want a surprise leave it blank! A cross between a lemon and lime, the Japanese fruit Yuzu imparts a slightly sour citrus note (we think more like a grapefruit) with lovely texture and nuttiness coming from the sesame seeds. 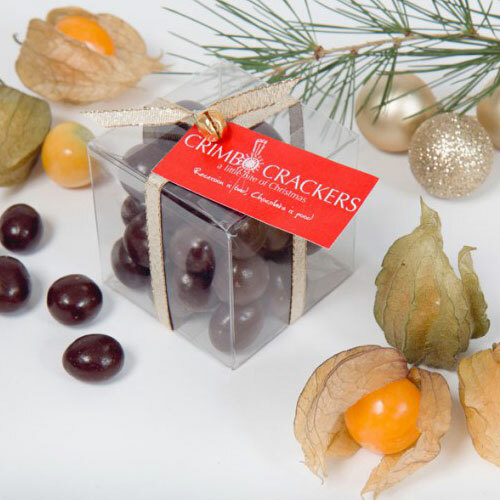 We love these – a crisp, crunchy dark chocolate shell reveals a tart, tangy fruity centre of dried physalis – those little orange fruits with the wings! Something a little different this Christmas for after dinner perhaps? When the going gets tough have a handful of these babies – a smooth mix of milk and white shiny baubles of chocolate with some salted caramel mini balls thrown in for good measure! You’re welcome! 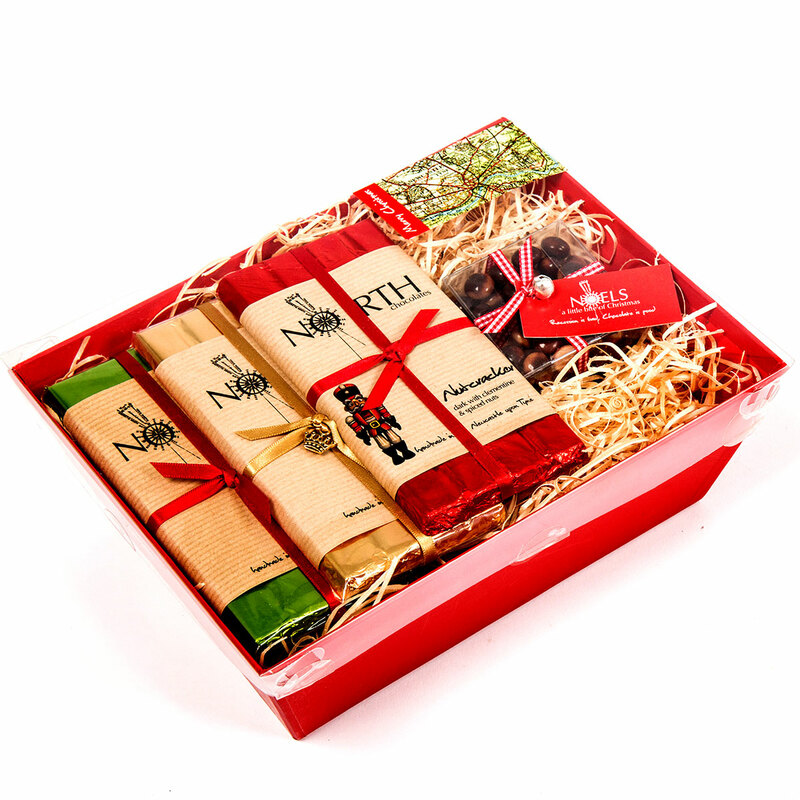 Three bars of your choice and a pack of your favourite chocolate nibbles to keep everyone going through the festive season in a black or red festive, re-usable box. 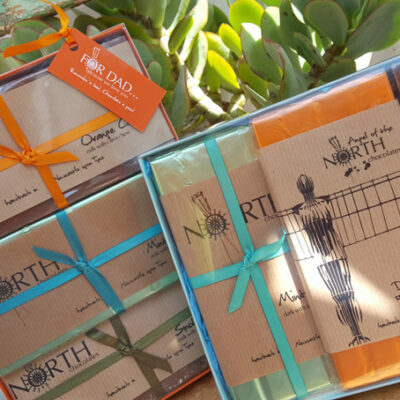 NB: Remember to put what bars (and whether milk or dark) and the colour box* you’d like in the notes section when ordering! *We may have to substitute the colour depending on demand. 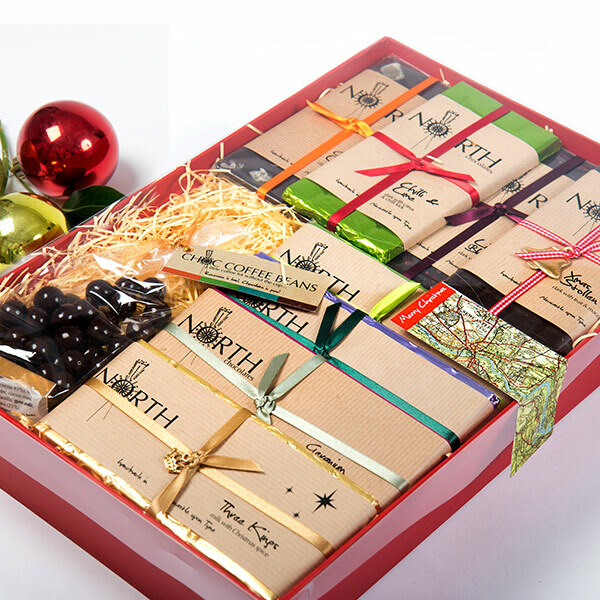 Pick your loved one’s favourite bars and we’ll jazz them up in a lovely gold gift box complete with a box of Milk Noels – chocolate nibbles to keep you going throughout the festive season. NB: Remember to put what bars (and whether milk or dark) you’d like in the notes section when ordering! Show Me The Bunny! Mr Bunny is a gorgeous creamy milk chocolate or rich 70% dark dreamboat complete with edible carrot – suitable for vegetarians and vegans! What’s not to love? NB: Please stipulate dark or milk in the Notes section when ordering. 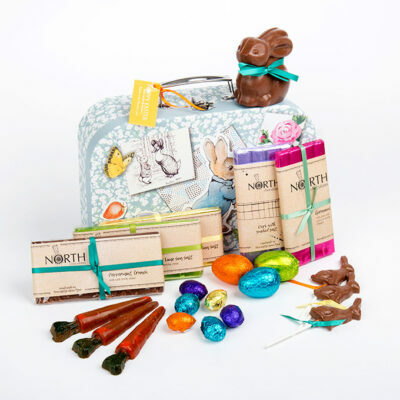 A wonderful start to Easter with a gorgeous Peter Rabbit luggage case stuffed with bars of your choice (please remember to add your flavours and whether milk or dark, to notes at the Checkout), Mr Bunny (natch), jewel eggs, bunny lollies and even chocolate carrots! Fill yer boots! 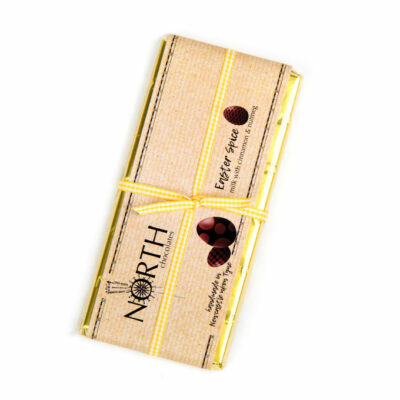 A lovely gentle hint of cinnamon and nutmeg permeates this dreamy milk chocolate Easter bar. Hold off the bunnies! 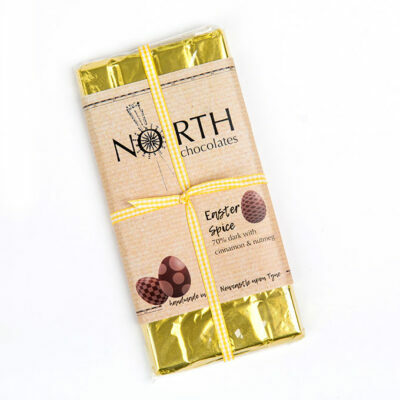 A gentle hint of cinnamon and nutmeg fill this rich, dark 70% bar. Hoppy Easter folks! (And no, that’s not a spelling mistake…). A cracker (geddit?) 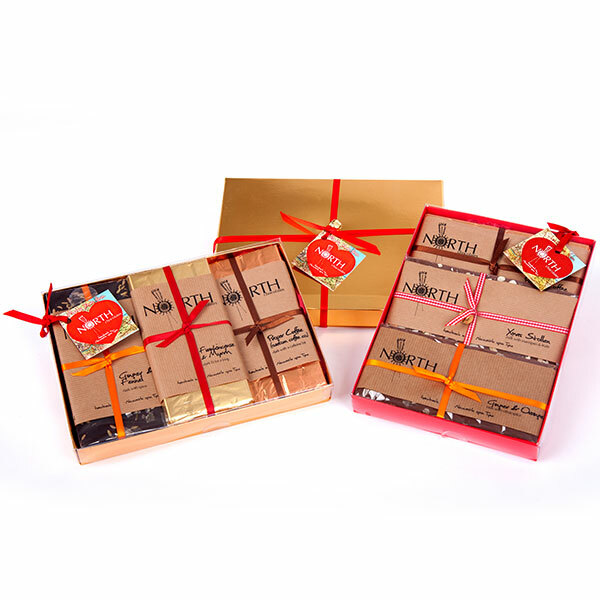 of a christmas pressie with 3 bars of your favourite dark chocolate bars * plus a bag of chocolate covered coffee beans to keep the energy levels high! 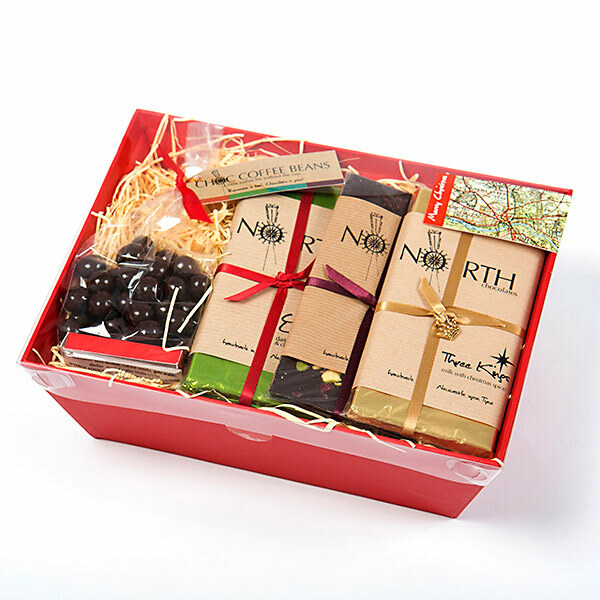 * Please state your favourite bars and whether you would like a Red or Black box** in the notes section when ordering. If you have no preference we’ll surprise you! ** As the season progresses we cannot guarantee the colour. A cracker (geddit?) 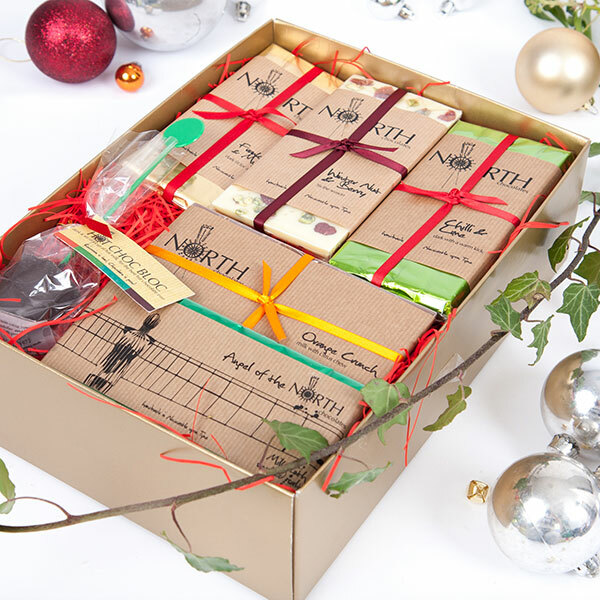 of a christmas pressie with 3 bars of your favourite milk chocolate bars * plus one of our winter warming Hot Choc Blocs! *Please state your choice of Milk bars and if you prefer a Red or Black box** in the notes section when ordering. If you have no preference we’ll surprise you! **as the season progresses we will not be able to guarantee the colour. 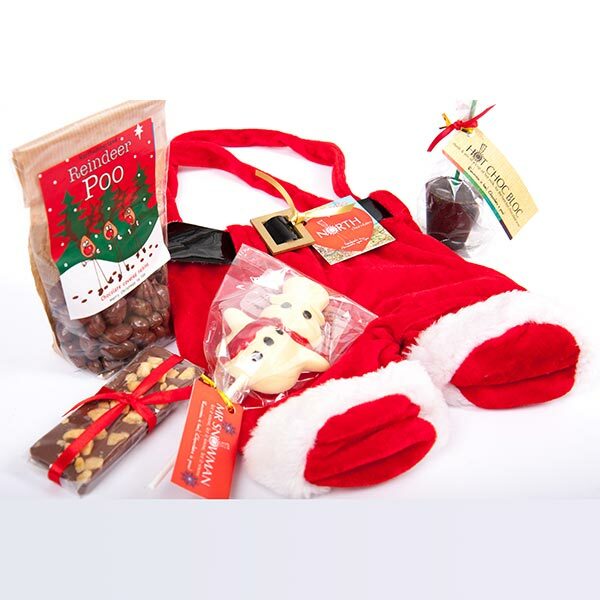 Our award-winning Angel Hamper is for the Angels in your life! 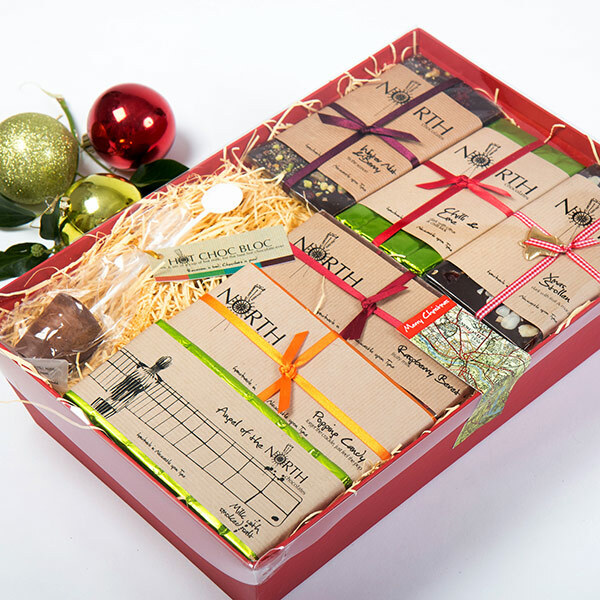 Treat them to 5 of their favourite bars * and we’ll top it up with an Angel (in Milk or Dark) and one of our winter warming Milk Hot Choc Blocs! 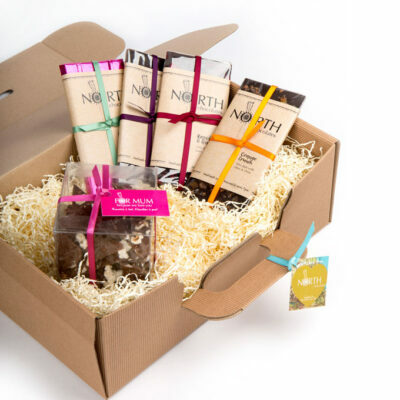 A gorgeous hamper in a reusable box filled with 8 bars of your choice * and dark chocolate covered coffee beans to keep the energy levels up! 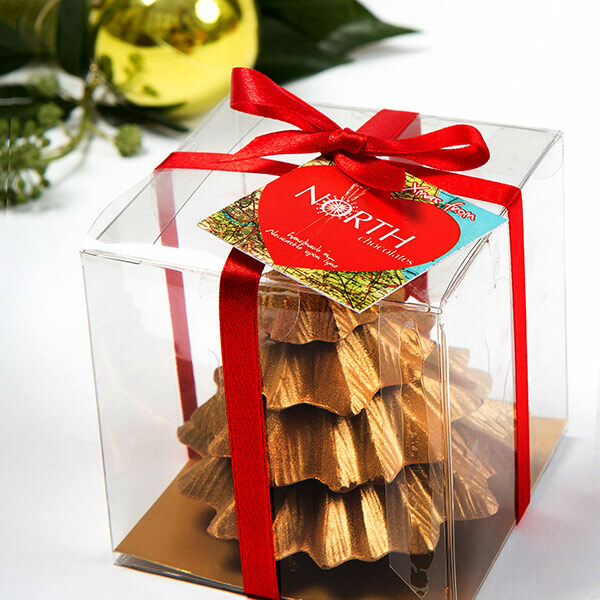 A gorgeous mini gold Christmas tree made with solid milk chocolate complete with gift box and tag. And best of all, there’s no needle drop with this one! f you like liquorice we think you’ll like this one but if you don’t – you’ve been warned! 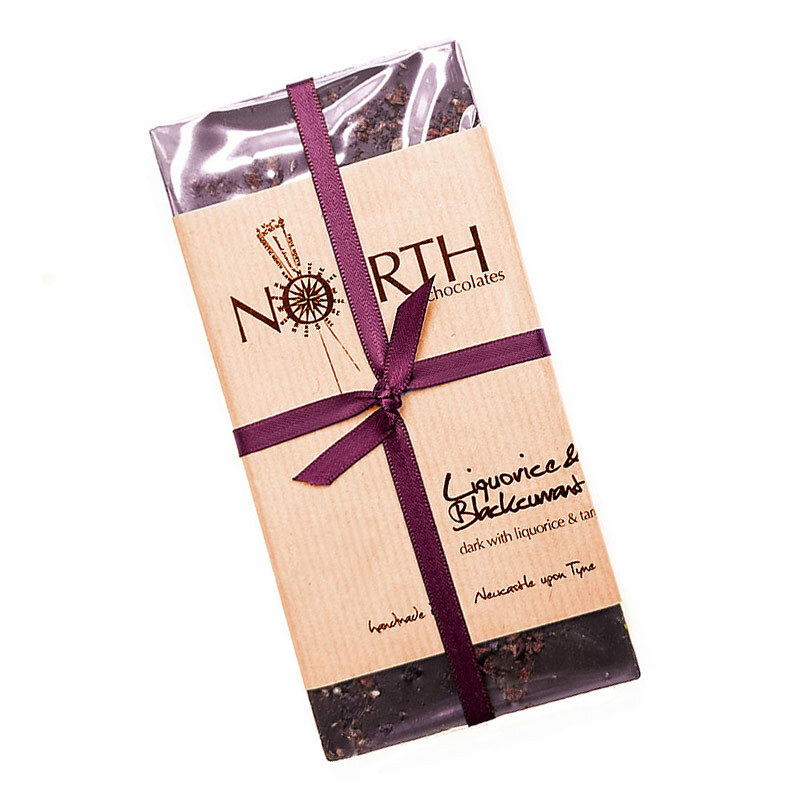 Warming aniseed tones offset with tangy blackcurrant this is one of our best-sellers and one of our favourites. Oh my this is a doozy! 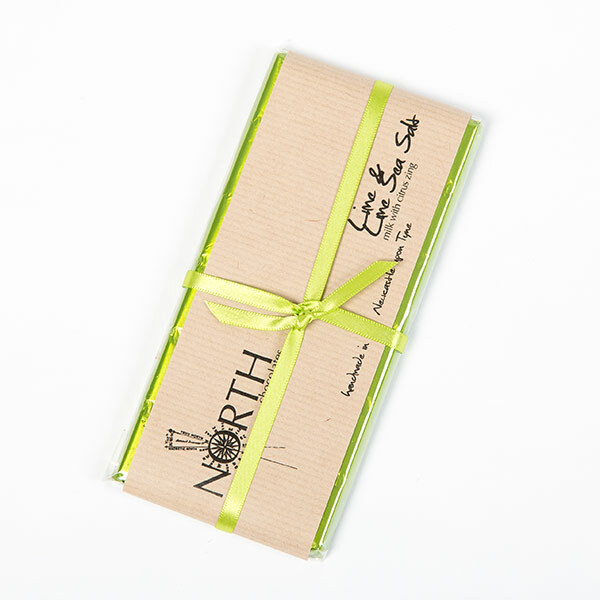 A sibling of our award winning Lemon & Lemon Sea Salt bar this is a more punchy fella with the lime and salt doing a little salsa on your taste buds! Commended in the Quality Food Awards, if you love liquorice we hope and think you’ll like this – if you hate liquorice then move along! 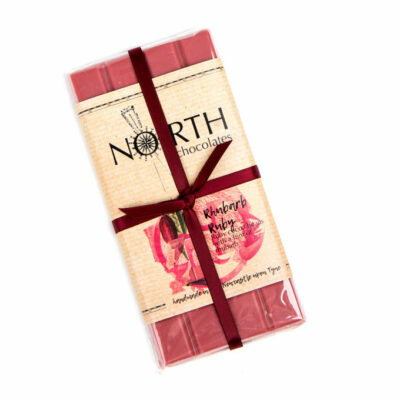 Deep warming liquorice with a burst from the tart blackcurrants, this is one of our favourites! A lovely present to treat your dad on Fathers' Day! 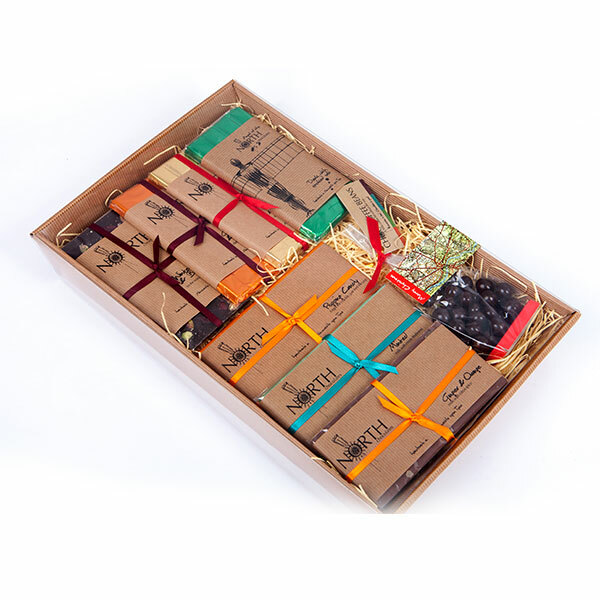 Colourful box with tag ready to be filled with three of his favourite bars – don't forget to add your preferences in the message page when paying! Made with the Pure Lintong bean from Sumatra, freshly roasted from the Ouseburn Coffee Company, if you like coffee this is a cracker with a slight texture from the beans. Mmmm! For those who like their chocolate! 7 bars of dreamy milk or rich dark along with a bag of Chocolate Coffee Beans, perfect for a little caffeine pick me up after all the festivities. NB: Please stipulate what flavours and whether Milk or Dark in the ‘special requests’ when ordering. SOLD OUT:Santa where’s yer troosers!? 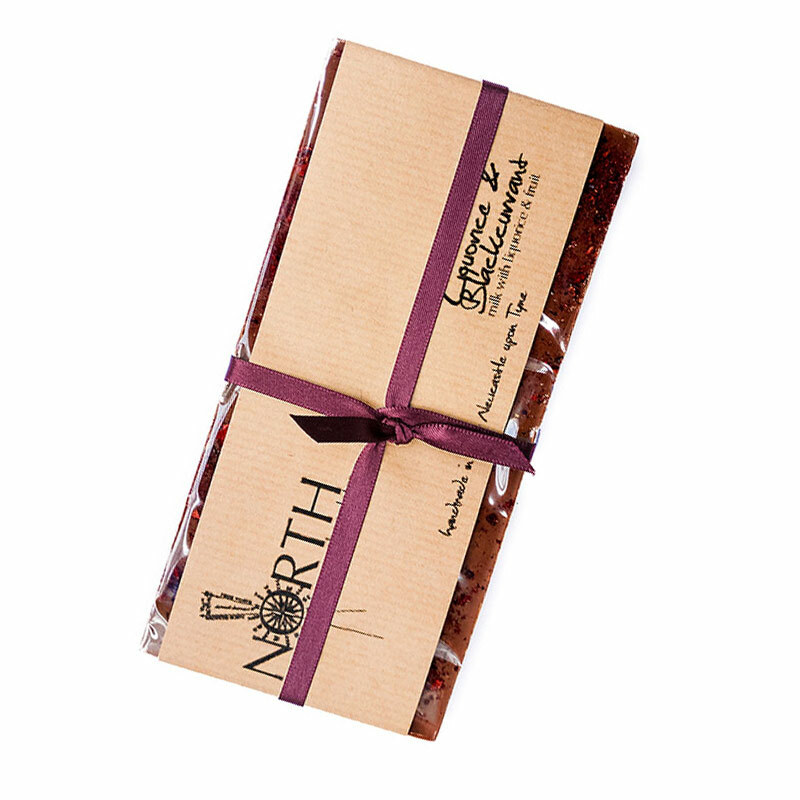 Dreamy milk with a slight hint of smoke and salt from Newcastle based, Northumbrian Smokehouse’s hand smoked almonds. 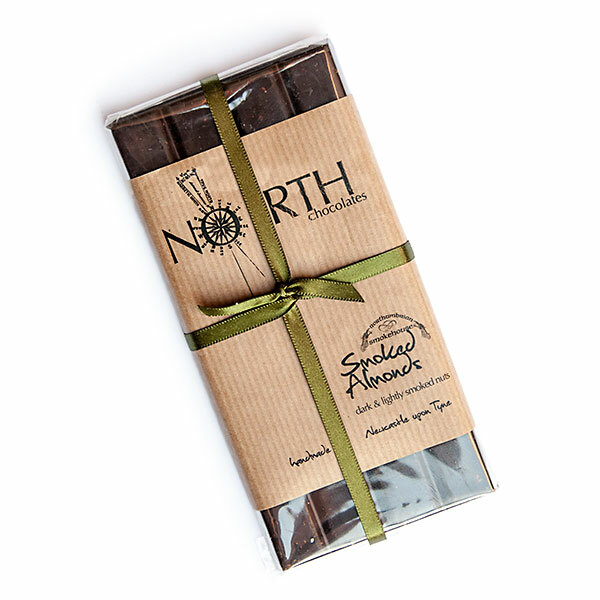 With delicious almonds, hand-smoked by Northumbrian Smokehouse based in Newcastle, this bar has a hint of smokiness, a little smoked salt and a little crunch to match. 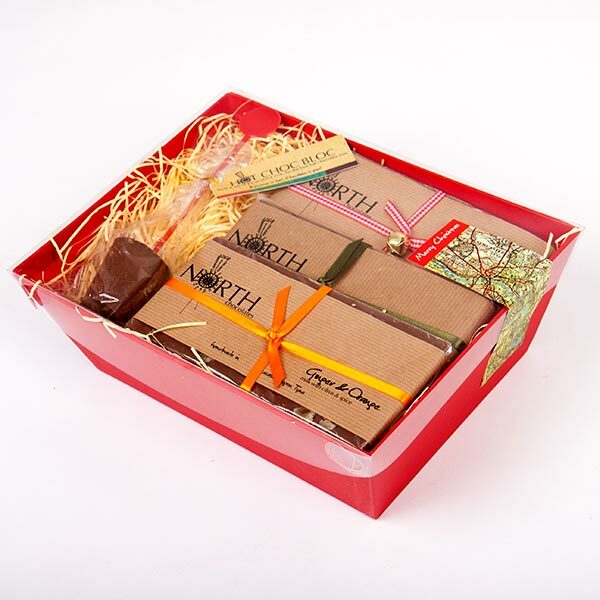 Lovely festive hamper with 3 milk bars and a dreamy Hot Choc Bloc for a winter’s night of dunking. NB: Please stipulate which flavoured chocolate bars you require in the ‘Special Instructions’ box when ordering. 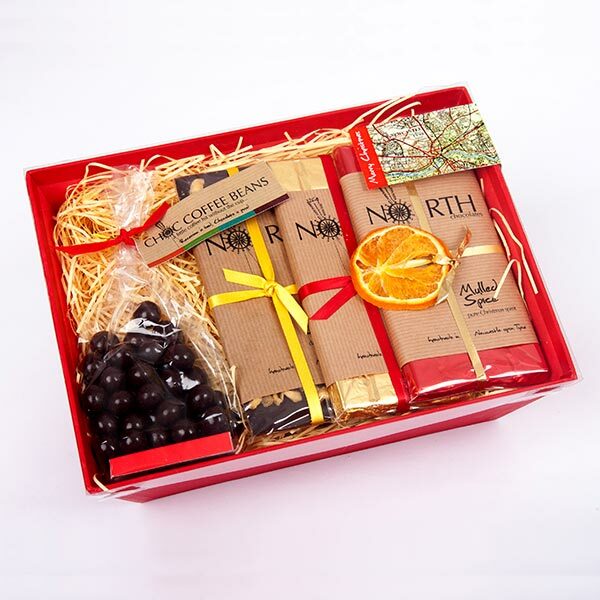 Festive boxes filled with your favourite 3 bars! Happy days! 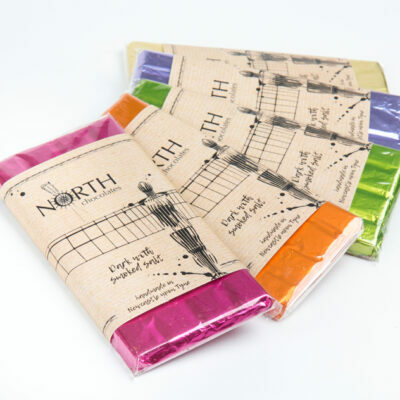 NB: Please stipulate which flavoured bars you would like (check whether in stock first!) and whether Milk or Dark in the ‘Special Instructions’ box when ordering. Also stipulate whether a clear lid is required or a full gold lid. If no instructions are left we’ll presume you’ll want a surprise! It’s back and better than ever! 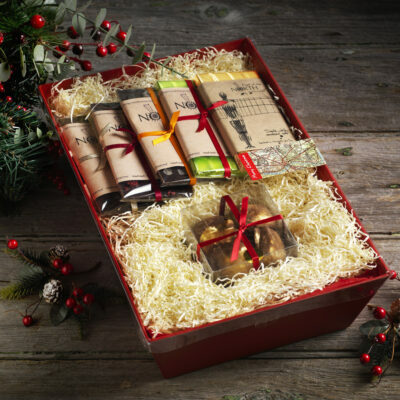 Winning the best ‘Festive Selection’ in The Journal last year, this cracking hamper is stuffed with 5 bars of your choice (including a milk or dark Angel bar) as well as a Hot Choc Bloc just in time for those winter nights. NB: Please stipulate which flavoured bars you would like and whether Milk or Dark in the box marked ‘special instructions’ when ordering.